The UK Government, both in its manifesto and in the recent Housing Green Paper, committed itself to a step change in the delivery of high quality new homes across the country. Research supported by UDG puts those aspirations in doubt because of worsening design skills gaps in English local planning authorities. This report summarises the findings of a freedom of information survey of urban design skills within local planning authorities, and how they have changed over the last five years. It demonstrates that urban design skills and capacity within local planning authorities are woefully low and declining and that these gaps are not being filled by the patchy, albeit increasing, use of design review. Critical gaps exist within local planning authorities, including the ability to produce proactive design guidance in-house in order to positively shape the future of new housing developments. • There has been a significant move to role sharing, with urban design now a typically only a fractional responsibility within a larger role, e.g. conservation and design, and no longer conducted by an officer or team with specialist design expertise. • Only 19% of local planning authorities are regular (ie monthly or quarterly) users of design review. This is despite the National Planning Policy Framework stating: “Local planning authorities should have local design review arrangements in place to provide assessment and support to ensure high standards of design“(para.62). 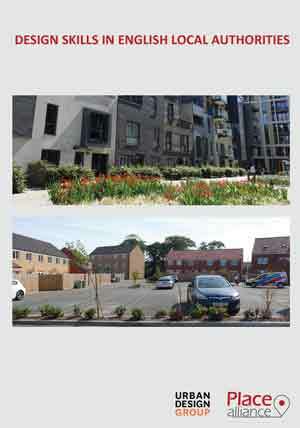 • Urban design related training is still available for three quarters of planning officers and half of councillors, but typically this is minimal and focused on raising awareness rather than on developing design skills. A very real danger now exists that as we gear up to deliver a greater number of homes nationally, the absence of design expertise locally will result in a new generation of substandard developments. This, for example, includes new housing estates that are dominated by roads and tarmac, lacking any greenery or character, and which are disconnected from public transport and local amenities. These, moreover, will be with us for generations to come. The research was conducted by Professor Matthew Carmona and Dr Valentina Giordano at UCL’s Bartlett School of Planning with financial support from the Urban Design Group and the Place Alliance.